Hello! Can I have your attention for this beauty, please?! Oh, I don't even know why I'm asking for attention, since this beauty is a real eye catcher. Prepare yourself for a load of pictures, because the colour changes in the light. Sigh..
For swatches and more photos of Sephora's Diving in Malaysia, click! 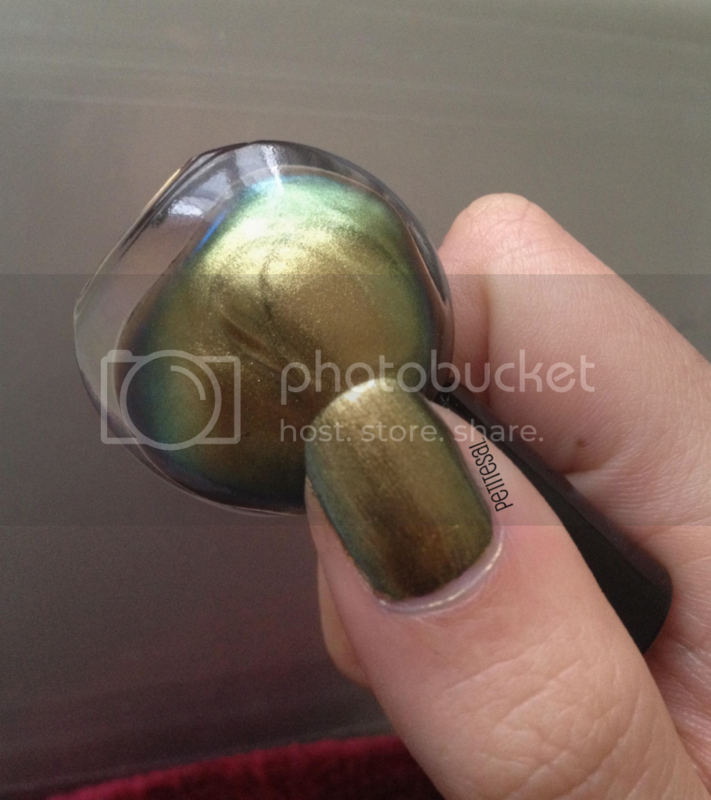 How can anyone resist a beautiful nail polish like this? I'm in love, let me tell you! The colour is gold-green-blue-olive-and-a-little-purple-ish. It really depends on the light. The colour reminds me of bugs and oil on water. Not really something to be excited about, I know, but I'm very excited about this nail polish! The only down side is that you need at least 2 coats to get a beautiful colour and 3 coats for a deep colour like the bottle. In the pictures above I'm wearing two coats. In the pictures below I'm wearing 3 coats, except for the swatches with a dark nail polish as a base coat. Just keep on reading! 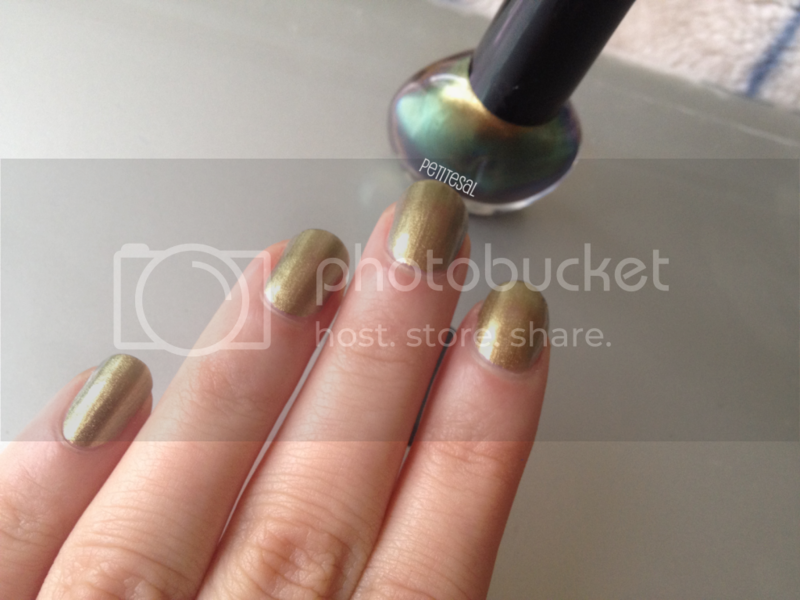 Here you can see that the colour looks gold with a green undertone. Here it looks olive green. Look how much the light makes a difference! The first 2 nails look gold, the second 2 look green and my pinky looks bronze! 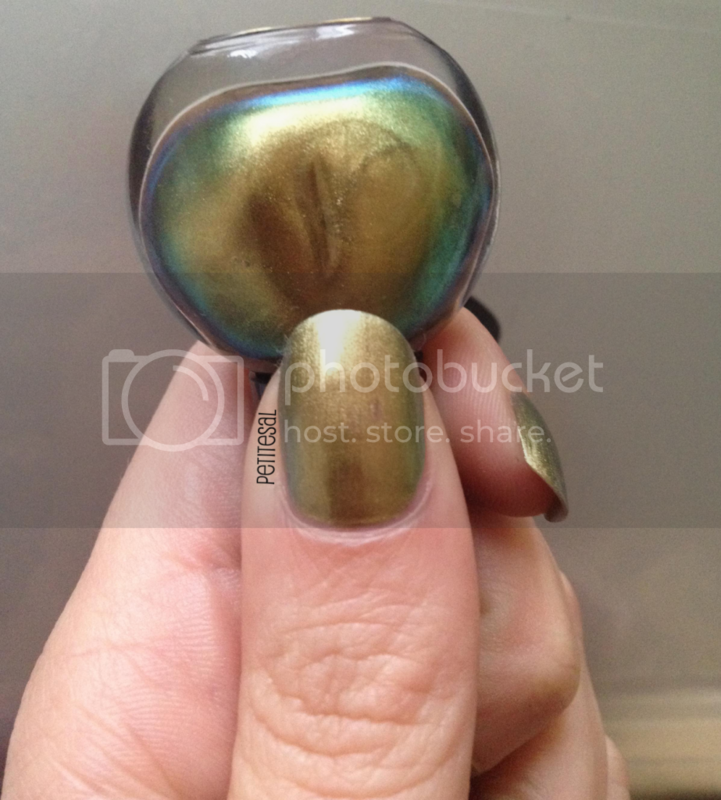 This nail polish looks beautiful as a topcoat as well. If don't want to apply 3 coats, just apply a dark colour and then Diving in Malaysia on top. It also makes the colour a little more intense. In the 2 pictures above I used a black nail polish and a coat of Diving in Malaysia. I wore this colour at work and at least 3 people asked me if it was Chanel's Péridot. I knew it was a dupe, but I didn't know it looked that similar. I don't own Péridot, but I searched for some swatches online. And yes, they do look very similar! Sephora's 68 - Diving in Malaysia costs €5,90 at Sephora for 5 ml. Oh, and very important: it lasted 4 days without chipping. Not bad, huh! Oh, I can keep rambling for hours about how beautiful it looks and how multi-coloured it is, but I think you got the point! It's definitely one of my favourite nail polishes at the moment and I'm wearing it pretty often. So, what do you think of this metallic beauty? Catrice had a really similar one, but more on a brownish side. Haven't worn it in a while, I don't like brownish shades on my nails :D It's called Genious in a bottle. It was discontinued last year. Defiantly similar to peridot! I love nail polishes like these! I got some by bad apple a while back and love them! Gorgeous colour, I really love the shape of the bottle too! OMG, I could die in that nail color! Lijkt heel erg op die van Catrice, vind hem echt mooi! It's perfect for dress with similar tone I guess :3 look good! Oh wow, what an absolute beaut. I was going to say that it reminded me of Chanel Peridot! I had a minor obsession with shades like this last year but never actually picked one up, although I did get a beautiful multi-tonal green. Now following on GFC - be great to follow each other. I think I need this color in my life, I've had a crush on chanel peridot since forever, this looks like the perfect dupe, what an exotic color!